The first expansion for Days of Steam is here at last. 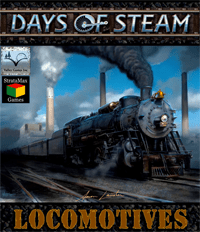 Aaron Lauster has brought some new mechanics to this wonderful title by adding new buildings, more track, and cool Locomotives! A few days of steam have passed and a new age of industry has dawned. Factories sprout up producing goods that need delivered. Advances in technology result in faster and safer locomotives and the market responds with numerous coaling stations to feed the need for speed. Players use newly designed locomotives that can be upgraded with technology giving each player the ability to customize their train. Goods can be produced by the newly added Factory tiles that will produce a good for delivery based on the Factory colour. There are also Coal Stations that offer coal to passing trains for easy fuel. This expansion requires the Days of Steam Game in order to play allowing 2-4 players a great game in about 45 minutes.